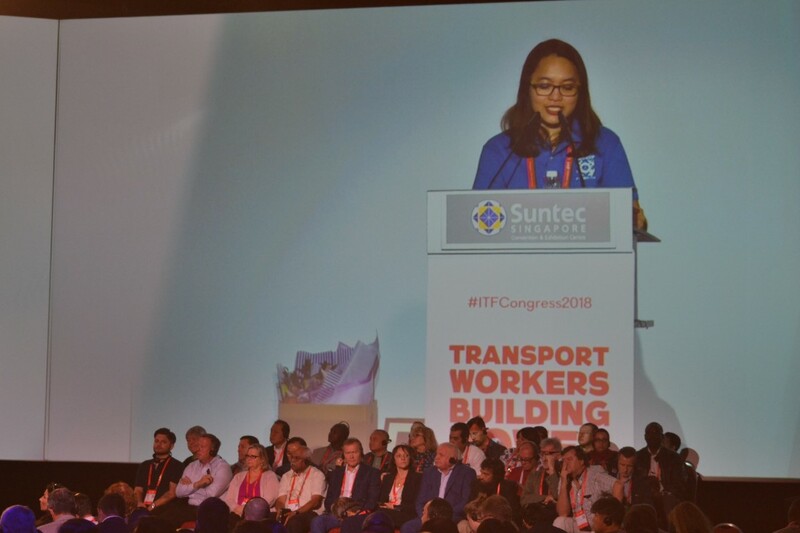 Suntec City, SINGAPORE– Libyan Trade Unionist Nermin Al-Sharif stole the show at the Women Transport Workers’ Conference on Day 5 of the 44th ITF Congress in Singapore. Al-Sharif, General Secretary of the Dockers and Seafarers Union of Libya made an emphatic testimony about her experience of being denied to travel to an ITF event in Morocco as authorities confiscated her passport. Al-Sharif shared before the delegation how the ITF helped her gain international support and sympathy and how that massive support she got from men and women all over the world resulted in her liberty. 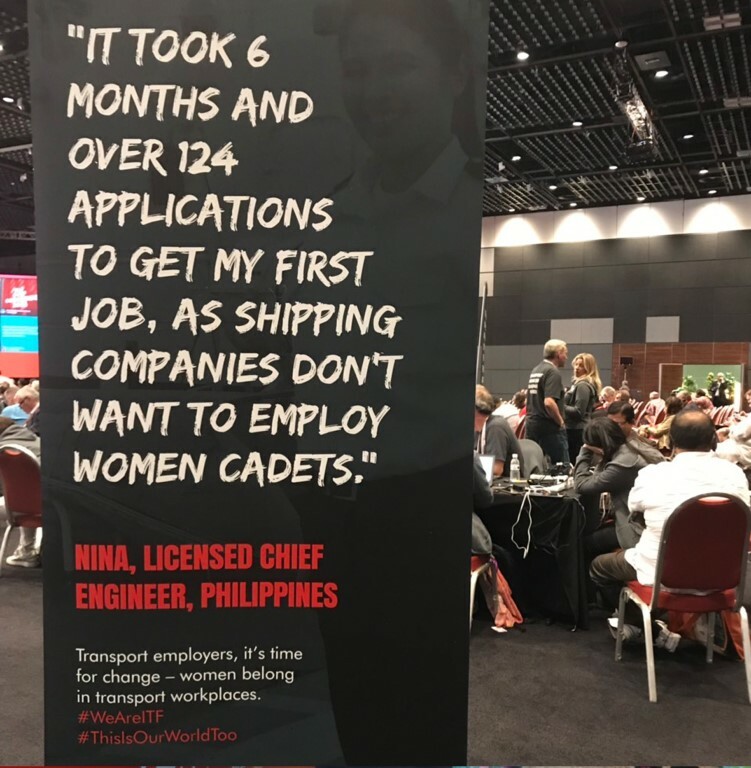 She also challenged all the women at the conference to never settle and always aim for higher roles and greater responsibility and influence in the organization they are in. Elected as the ITF Women’s Committee Youth Representative, Capt. Labarda also discussed about the Women Transport Workers’ Conference before the Congress Plenary. It was reported that the women at the conference agreed to have two priorities that they deem significant not only to women, but to humanity as a whole. First, building women transport workers’ economic power by ending gender-based occupational segregation in the global transport industry, and second, building the power of trade union action to end violence against women transport workers, including the achievement and ratification of an ILO convention and recommendation on violence and harassment in the world of work. The women at the conference have agreed to build the Our Public Transport program where gender is strongly embedded, to support warehouse, hubs and informal workers’ programs by promoting gender equality, women’s leadership and organizing women workers, and to mark global action days such as International Women’s Day on 8th of March, UN Day for the Elimination of Violence against Women and Girls on 25th of November and World Toilet Day on 19th of November. Launched at the Women’s Conference is a new report on the impact of the future of work for women in public transport. 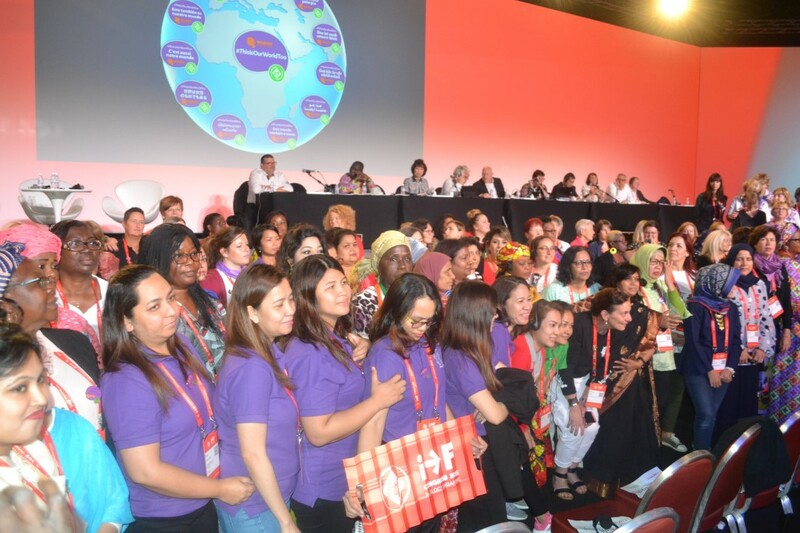 A very interactive and free flowing discussion also took place at the conference where delegates from different parts of the world share their own experiences, learning, and even words of encouragement and hope for women in the other unions. Delegates raised their views on the empowerment of women transport workers through training to work with digital technologies, increasing union membership of women transport workers, equal pay and working conditions, recognizing the impact of the menopause on women workers and putting pressure on employers to introduce policy, violence against women, including the global women’s advocacy program and domestic violence paid leave, integration of women into leadership and decision-making structures, as well as women’s structures, ending gender-based occupational segregation and addressing safe access to toilets. The Women’s Conference then endorsed a motion on informal workers and reconfirmed that there is no place for hostility and disrespect at any ITF event. The women also remembered the inspiration, devotion and contribution of ITF Executive Board-elect Ann Anderson, who was the ITF Women Transport Workers’ Committee Vice-Chair and General Secretary of CCWU in Guyana. The Women’s Conference completed the elections of the ITF Women Transport Workers’ Committee with Diana Holland as the Chair. “We are making a difference. Our unions now report 800,000 women members. But nothing is ever handed to us on a plate. This increase comes from organizing and struggle across the world,” Holland said.